UAE: Dr Lalit Parida, Consultant Pediatric Surgeon at GMC Hospital, Ajman operated upon the 12 days old baby and corrected the rare anomaly. When a baby was born to a certain couple their joy was understandable as their previous baby had unfortunately died during pregnancy. But their happiness was short lived as the newborn baby gradually developed severe breathing difficulty. He was investigated at GMC Hospital, Ajman and found to have right sided congenital diaphragmatic hernia. In this defect there is a hole in the diaphragm, which is the muscle which separates the chest from the abdomen. In their baby, there was a large hole in the right side of the diaphragm muscle. The entire right side of the liver along with the large and small intestine had gone into the right chest through this hole. These organs then pressed the right lung directly resulting in severe breathing difficulty and also the heart was pushed to the extreme left side of the chest. This is a life threatening condition and the baby was put on a mechanical ventilator (breathing machine) in the hospital�s NICU (neonatal intensive care unit). The NICU team consulted Dr Lalit Parida, Consultant Pediatric Surgeon at GMC Hospital, Ajman for the surgical treatment. The parents were explained in detail about their baby�s condition by Dr Lalit, who then operated upon the 12 days old baby and corrected the anomaly. While explaining the surgery which was done under general anesthesia in the 2.8 kilograms baby, Dr Lalit said he made an incision in the abdomen and had to bring back the liver and intestines from the chest into the abdomen. He then closed the large hole in the diaphragm muscle and then finally closed the incision made in the abdomen. The baby had to stay on the mechanical ventilator for few days after surgery and thereafter was breathing and eating on his own. The baby was finally discharged from the hospital in excellent condition. The parents were very happy when they received their bundle of joy and expressed their gratitude to Dr Lalit and all involved hospital staff for the successful treatment. According to Dr Lalit, this is a rare birth defect which is seen once in every few thousand births and is usually seen on the left side of the diaphragm and right sided diaphragmatic hernia is uncommon. These babies can have additional lung, heart and bowel defects which can be very severe in some cases, sometimes even resulting in death. Dr Lalit Parida is working as a Consultant Pediatric Surgeon at GMC Hospital, Ajman which is the first JCI accredited hospital in Ajman. 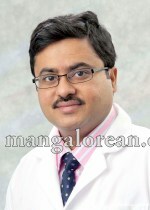 He has received his Pediatric Surgery training from the prestigious All India Institute of Medical Sciences, New Delhi, India. He has additionally received advanced surgical training in USA from the highly prestigious Memorial Sloan-Kettering Cancer Center, New York and St. Jude Children�s Research Hospital, Memphis.